**How is it that everyone on GLEE can instantly break into song? And they know ALL the words. I mean, I would love to live in a world where we sing everything, but how would I remember all the words? Oh, yeah, it’s television. **It seems that every year when womens conference comes around, the weather takes a dive. It was gorgeous weather last weekend, and even Monday of this week were warm and nice. But today–the day before we are scheduled to tromp all over BYU campus, we have gald force winds, snow, rain, hail, and the temps seem to be about 31 degrees out there. We’re not young students anymore. We can’t handle sludging around outside in the snow and rain. I may end up in the Marriot Center for the entire two days. **The elementary school band concert. It makes me go “hmmm.” Bless their hearts, those kids are trying very hard to make music. And bless their instructors! Those two women must be saints! Their last song was “Pirates of the Caribbean.” Natalie had told me it was her favorite song of the concert, so I was looking forward to it. Hmmm. Good for them for attempting such a challenging song. **Jenna’s home sick today. Her throat hurts. I’m hoping it’s just an allergy thing and she’ll be fine with just a day of taking it easy and skipping school. Hmm. **Do you think “Oh, my gravy” will take off as a new trend in speaking? I think that would be great. **Yesterday I cleaned out all the shoes that have accumulated in our mudroom. I put them all on the island in the kitchen, sorted and paired up. When the kids came home to a counter full of shoes, they said, “hmmm”. Then they took all the shoes they wanted to keep up to their rooms, so that a person could hopefully finally walk through the mudroom without tripping. When all the shoes were claimed, there was a whole bag of shoes that no one wanted, and there were 6 singles. Six single shoes with no match? What? Where are the other shoes? **Why is it that I am powerless to a cookie? Something about all that sweet loveliness in a little portable package makes me powerless to resist EATING IT. What? **I finally got caught up on my LOST episodes. So John Locke is now the evil one? He’s like Satan? Hmmm. And they have to keep him on the island and not let him out to the rest of the world. Is that about right? **I need a topic for Relief Society this Sunday. At first I was planning on teaching this Sunday, then another lady asked if I would teach in June, and she would teach in May. No problem. But she just asked me this week if I would indeed teach in May. Which would be this Sunday. Which is in four days, and I have NO CLUE what to teach! Hmmm. Or rather, Help! I’ve been wanting to take the kids to the tulip festival at Thanksgiving point. I thought we might go yesterday, since the weather was nice, but we ended up working in the yard and garden, which is also a good thing. But it looks like we’ve got our own tulip festival going on here. Ryan was so kind to post this little video onto youtube so that I could share it with you. It starts slow, and it’s not all that exciting, but take a look at the kind of visitors we have late at night around here. I guess I need to get more irish spring around those flowers if I want to save them. And in the spirit of strange things that the porch cam has recorded, here’s another one. It makes me laugh every time I watch it. And we did ask Cole if it was ok to make fun of him on the blog. He’s a good natured soul so he didn’t object too much. I don’t know what he was making a face about, but it just cracks me up. When we were put in as a Relief Society Presidency a little over one year ago, we tried to think of something fun to do for the sisters when they had a birthday. Send a card? Take over a small gift? Nice, but we wanted to do something different. Our decision was to host a birthday dessert once a month for everyone who had a birthday that month. They could come over to a member of the presidency’s house, have a nice dessert and a fun evening chatting with the other birthday guests. As the year finished out, we hadn’t gotten the turnout we had hoped for. Sometimes it was just one birthday guest who came. So we decided to tweak it a little bit and only do the birthday desserts every OTHER month. That way there would be 6-15 people invited instead of just 4-8 people. I was assigned the March and April birthdays. “Great,” I thought. Two of my good friends have birthdays this month, and there are at least 12 birthday, so I was looking forward to a fun evening. I didn’t go to a huge amount of trouble making dessert, but I did have pound cake with strawberries and blueberries and whipped cream, and it made for a very pretty and fresh treat. After running the kids to soccer and baseball practice (and the last minute ultimate Frisbee game–ugh) I was ready for the guests. Our Relief Society Second counselor came. We chatted for a bit, hoping that a few of the ladies would come. since we had sent out invitations and had it on the calendar for a while. and invited them to eat the dessert. Is it me? Am I a bad hostess? I seem to host a lot of things where No one comes. I hosted a way fun clothing party for myself and one of my friends, once. Seriously. Out of the 50 invites I sent out, one person came. Well, at least it’s not a total loss. My house is clean (well, the main floor, at least) and if I can avoid feeding my children or letting them eat any food, do any homework, or even get the mail, I can keep it clean for my family party–who I KNOW will come– on Sunday. Yes, I know that the keeping it clean part is a dream, but at least it’s clean NOW, and I can look at the nice clean counters and be happy. I absolutely love Spring. Love, Love, Love it! All the trees look like they are dressing up for the season, the daffodils and then the tulips push their way up even when it seem illogical for any flowers to start blooming. It’s cold, then warm, then cold again, and so when that perfectly beautiful day comes along that is not too hot and not too cold, you appreciate it all that much more. People come out of their homes and end the hibernation that has been going on for the past 5 or 6 months. We begin to see our neighbors once again as they begin to examine their yards and the work that must be done. It’s kind of like a mini reunion –“Hi! Don’t you look good! Where’ve you been?” they say. “Oh, you know…..inside.” we answer. Yes, there’s that annoying high pollen count, but we don’t want to talk about that right now. In spring I start to feel like anything is possible. Even exercise. I seriously have the urge to get outside and get moving. Maybe go out walking or do some strenuous gardening. Speaking of gardening, I love to work in my garden and flowers in the spring. I love to get out and pull the weeds, plant summer bulbs, even plant vegetables. I planted lettuce this week, and I was thrilled to see a couple of repeat plants from last year. It looks like lettuce and hollyhocks so far, but there may be some other volunteers there as well. It’s too early to plant tomatoes or the cabbage that Jenna brought home from school, but when it’s dry again this weekend I plan to get the peas planted, and maybe head to the local garden store and buy some other tender plants. So, even though today it’s snowing, I know the snow won’t last long. 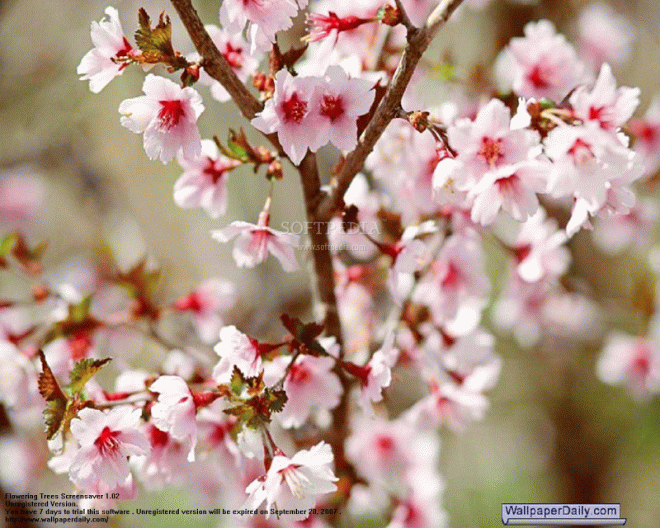 It will give way to green grass and happy flowering trees. I will breathe in the scent of fresh, new life. I will relish in the feelings of newness and the smells of blooms. I will enjoy my favorite season and be thankful for the beauty that is spring! I don’t think I’ve blogged about some of my recent painting projects. How irresponsible of me! I have been wanting to paint the kids’ bathroom for quite some time, and this year I finally got to it. First we painted the walls green. And by “We” I mean mostly “Me”, although I let the kids have a turn painting if they wanted to. Once I had the base coat right, I tried a process called “Smooshing”, which is done with a mix of glaze and paint and plastic. While the paint/glaze is wet, you lay plastic ( used garbage bags that I opened up) on the painted area, then you kind of move the bag around a bit, or smoosh it. It’s actually kind of fun, but I found myself getting paint ALL over myself. When you peel that plastic off, it leaves this effect. I don’t know how anyone gets good pictures in a bathroom, I tell you. But I’ll do my best. I also made curtains for the windows (we’ve been in this house almost 9 years and can you believe I have NEVER put curtains up in this room? Shameless, I tell you!) and fancied up a shower curtain. I had some beach decor stuff sitting around waiting for a place to live, and I thought they would work well, so those went on the walls. When it was done, I LOVED it. I love the effect, and I want to find an excuse to do that again in some other room. Sorry the color looks different in each picture. That’s what you get when you take pictures at all different times of the day. Now I’m itching to repaint the main floor. Not change the color (at least not yet), but just to make the old tired paint look fresh and new. But that will have to wait until school gets out. This story isn’t mine. It is my sister’s. My sister with the 11 kids who SHOULD have a blog, because her life is amazingly funny, but how would she keep up with it? She has 11 kids!? This week cereal is on sale at Smith’s for $1 a box. When you have a large family, you stock up on cereal when you can buy them for $1 a box. I bought 30 boxes and I had a couple of coupons, so I was thinking I was pretty clever getting those 30 boxes of oatmeal, Life and Captain Crunch for $27. Oh, how wrong I was. My sister called me and told me how I could get that same cereal for 40 cents a box. Yes, you have to be sneaky, and yes, it takes more work, but 40 cents a box? While Smith’s is having their sale making the cereal $1 a box (after the instant rebate at the checkout, yada, yada.) Macey’s, Dan’s, and Harmon’s are also having a sale on Quaker cereal, but they use an in-ad coupon to get $3 off when you buy 5 boxes. Their deal isn’t as good as the Smith’s deal, though, so I had thrown those ads away. My brother-in-law, Tom, was cleverer than I. He took the coupons from the other ads, and used them at Smiths. First, he cut out all the coupons from the ads he had, and asked the neighbors for their ads, as well. Then, to get more ads, he went to his local Associated Foods stores and took a few ads from each store. He didn’t want to clean them out of their ads, so he said he wasn’t taking more than 10 from each. Then, using the competing store’s coupons along with the Smith’s sale price, it brings the total down to 40 cents each for a box of cereal. When she called me to apprise me of the deal, she said he had already gotten over 100 boxes of cereal, and was going back out for more. “So I don’t look so creepy, I’ll take one of the little kids with me,” he said. Because the last thing you want when grocery shopping for large amounts of cereal is to look creepy. I had already bought one round of cereal (and peanut butter, which was also on a good case lot sale), but I’m up for a great deal, so I tried it. First I looked through our box of newspapers for the ads. I found one ad from Kohlers, our local associated foods store. I cute out the $3 coupon. Then I stopped at Kohler’s to pick up some ads. Oh, and cake mix! Because they had cake mix on sale, and I didn’t want to just run in to grab the ads. I took my 6 ads out to the car, and WHAT?! Someone had already cut out the $3 coupon! Foiled! Oh,well. I’ll try the one coupon I have, and I can at least get $3 off of 5 boxes. I went over to Smith’s, put 10 boxes into the cart and went to check out. “Oh, we’re not accepting that coupon,” said the checker, “I guess we lost a lot of money on those coupons yesterday as we’re not getting paid for them.” She showed me on her little printed paper that they were allowed to accept the coupons from one store that don’t say “good for use ONLY at Associated food stores” in tiny print. Mine had the tiny print, so she was not accepting it. Probably because of Tom and people like Tom. Foiled again! After my day of working at the school and then cutting out endless skirts for kindergarteners, I called my sister back and told her how I had been foiled twice in my attempt to beat the system. “Oh, really?” she said, “Tom just came back from the store and he’s bought 500 boxes. Nobody told him he couldn’t use the coupon.” Erg. Tom had been to stores all over the Salt Lake Valley, from Draper to West Valley City in his quest for both coupons, and cereal. He couldn’t just go to ONE Smith’s store and clean out all their cereal, so he was making the rounds. He was only back to cut out and organize, then he was going back out again. It seems that 500 boxes is all that the Excursion will hold. As he was purchasing several cases of cereal, one lady said to him, “There’s no way you can go through that much cereal before it expires.” Are you kidding me? Having 11 kids, Tom is used to obnoxious comments and questions from strangers. He didn’t HAVE to justify his purchase to her, but he did say, “I have 11 kids. We go through at least two boxes of cereal a day. You really don’t think we can eat these 40 boxes of cereal?” If it had been me, I might have just laughed in their face. Do you need to give an explanation besides “Teenagers”? If I let my kids have free reign over the cereal, they would eat it morning, noon and night. A bowl of cereal is often the chosen afternoon snack at our house, providing we have milk to go with it. When I last spoke with my sister, she said that they hadn’t quite reached their goal of 1,000 boxes, but they were at 800! 800 boxes at 40 cents each– that’s $320 on cereal, but they’ve saved at least $2 per box off the regular price, so I’m going to congratulate them on their MAJOR cereal score. And if I run out, I know I can always go over to her house, as long as I bring my own gallon of milk. Please stop eating the library books. If you must eat books, there are plenty of books on the kids’ bookshelves that they hardly ever look at. Why don’t you try some of those out. They aren’t as new and crunchy as the library books, but I’m sure if you eat enough of them you will be satisfied. Ditto for the new socks. If you could just eat the socks with holes in them, that would make my life a little bit better. And there’s no shortage of those worn out socks, either. Eat to your heart’s content! You’ll find them on the floor in any one of the kids’ rooms. Really! Help yourself! And let’s stop taking the lids from the tupperware, shall we? I mean, what use do you have for JUST a lid? Use it as a Frisbee? If you must take the lid, please take the container along with it. I’m not asking for much. I’ll still let you stay here and live under the children’s beds. You are free to eat the leftovers and watch tv after everyone else goes to sleep. I’m only asking for a little consideration, here. It’s Monday after our Spring Break Vacation. Or, as it should be called–Vacation recovery day. **Laundry. Lots and lots of it. **Clean out and wash my incredibly tired car. And if I were really nice, I’d stop by Grease Monkey and top off the fluids, but that’s probably more than I could wish for. **Exercise. And the “vacation binge eating” must stop. **Find and return the overdue library books. **Find all the baseball mitts. Practices start today for John’s team, and I’m sure the girls’ teams will be starting up soon, as well. Everyone needs mitts, and we need to get outside and start throwing and catching. **Figure out the kindergarten skirt situation. You don’t want to know. **Maybe buy some groceries. These kids, they insist on eating. **Get all the activities for the month on the calendar. Since we were planning our vacation and the left at the beginning of the month, I’m shocked that the month is almost 1/2 over, and I am kind of still in a fog. What’s going on? What’s due when? **Vacuum up all the bird fluff. With 9 birds in our kitchen for a week, there’s some feather/seeds/fluff residue around. **Preen. For my flower bed. And it’s time to get the garden ready to plant! But first, it looks like I’m going to go and plunge a toilet. Somehow that one moves to the top of the list. Whew! Let’s see how I do, shall we? What’s on YOUR list? We are back from our week long vacation in sunny Arizona. It was a fun vacation, and nice to get away from the cold (and apparently..snow) of Utah. We split up our vacation into 3 different phases–the Grand Canyon, Robin’s house, and Scott’s house. –At the Grand Canyon, it was indeed GRAND. I enjoyed hearing every other parent saying, “(Insert name here)! Stay away from that ledge.” “That’s too far! Come back here, now.” It just added validation to my motherly paranoia. We were a bit surprised at how cold it was. Cold and windy. The kids got their Grand Canyon Junior Ranger Badges, and we used up several band-aids. And we stayed at the obligatory crappy hotel (see last post) in Flagstaff. We also drove through Sedona, which we enjoyed. –At Robin’s house, the number one attraction were the chickens. The kids spent hours playing with, chasing, petting and holding the chickens. We even started calling Jenna “the chicken whisperer.” Sarah and Jacob were also a great source of entertainment! Sarah even prompted Natalie to dye her hair. We also went to a really fun place called Amazing Jakes. We spent the day playing games, riding rides, laser tag, mini golf, and eating. Tons and tons of eating from the buffet. When we finally left, we were all so loaded with sugar and fat that we could hardly move. Ugh. I loved sleeping with the windows open, and hearing all the birds in the morning. Birds–so many of them. I guess Arizona is where all the birds fly to, right? And they were ALL chirping right outside Robin’s window, it seemed. Then the chickens started up. I don’t think anyone can sleep late in Arizona. Oh, and we dyed Natalie’s hair from this to this. –At my brother’s house, the main attraction were the cousins. John and Danny were inseparable, as were Jenna and Kaylee. The kids just had a GREAT time hanging out and playing. It made it difficult for their kids to go to school, knowing that they were missing out on valuable cousin playing time, but we left to go exploring while they went to school anyway. Two things Ryan said he really wanted to see were the Mystery Castle, which we had toured once several years ago, but wanted to take the kids, and go to Fry’s electronics. We were able to do both of those. We also went to the railroad park in Scottsdale, where the kids enjoyed riding the merry-go-round, playing in the park, going through the museum, and riding the train. We were also fascinated by the little wild bunnies that lived in the bushes there! How cute are they? –Las Vegas. On the way home, we stopped in Las Vegas (well, Henderson), and the Holiday Inn Express was GREAT. It makes up for that other crappy hotel. Good breakfast, two tv’s in our room, and clean. And it wouldn’t be a trip to Las Vegas for us without a quick stop at the Ethel M Chocolate factory. – and the cactus gardens. –Overall, I think we had a great trip. It was relaxing, not rushed, we took our time and saw what we wanted to see, the weather was beautiful, and it was an adventure. We didn’t stay too long at any one place, yet didn’t spread ourselves too thin. 1600 miles and under $1000, too. 4 1/2 out of 5 stars.